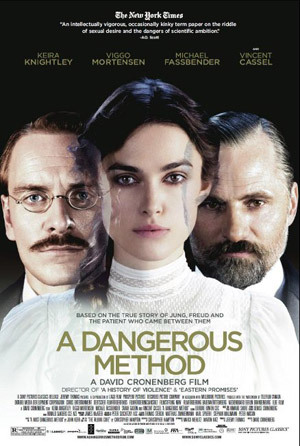 Keira Knightley, Michael Fassbender and Viggo Mortensen star in the biopic drama A Dangerous Method. Carl Jung (Fassbender) has just begun his psychiatric career, having been inspired by the great Sigmund Freud (Mortensen). A look at how the intense relationship between Carl Jung (Fassbender) and Sigmund Freud (Mortensen) gives birth to psychoanalysis. Running Time: 1 hr. 39 min. MPAA Rating: R for for sexual content and brief language. Early in his career, psychiatrist Carl Jung takes on the challenge of a seemingly impossible case, a deeply disturbed, beautiful young woman named Sabina Spielrein. Jung employs his mentor Sigmund Freud’s experimental “talking cure” in treating Sabina and the treatment proves to be successful. This results in Freud and Jung becoming colleagues rather than master and student, but before long, both men are involved with their patient, complicating their relationship.